Saturday was day two of the NY2LA Lone Star Invitational and the performances keep getting bigger heading into championship Sunday. Here are some of the players who stood out in the 16 and 17 under association divisions. Kyle Kluge – 2018 6’2” G Minnesota Comets Elite – Kluge turned in another impressive performance in the association in the Saturday afternoon session. Kluge is a scoring guard who can get you a bucket in a variety of ways. He runs the floor hard and scores in transition, he can shoot it off the catch and he’ll attack you in the half court as well. He’s still learning to become a point guard, but shows patience in initiating the offense. Once he learns to read the defense more effectively, he should improve upon his decision making and passing. Areas of improvement aside, Kluge’s scoring ability led to a game-winning three pointer against MBA. Chase Adams – 2018 5’8” PG SYF Players – After a pretty quiet first half, Adams essentially took over for SYF late in their game against a tough Wisconsin Swing team. Adams took it upon himself to relentless attack the rim in the open floor and in the half court in the closing minutes in the afternoon session. In fact, it was a late drive and foul at the rim that put Adams at the line for two free throws; both of which he would make. Those clutch free throws proved to be the difference in a 55-54 SYF Players win over the Swing. Orlando Allen – 2018 6’7” SF SYF Players – For a second weekend in a row we are intrigued by what could be when it comes to the developing Allen. His size affords him the opportunity to be versatile and that’s what we’re hoping he can become. Right now he operates well in the lane as a rim runner. He does a nice job filling the lane and finishing around the rim. He can also set picks and get himself to the front of the rim as well. Allen shows flashes of being able to attack off the dribble as well. With development on his jump shot and ball handling, Allen’s offensive ability could really start to take off. Trever Kaiser – 2018 6’3” F Minnesota Comets Elite – Kaiser is a knock down shooter with range. You can play him in pick and pop and he will thrive; especially if he gets a clean catch at the top of the key. Brevyn Spann-Ford – 2018 6’7” SF Minnesota Comets Elite – Brevyn showed real smarts as a defender. He communicated pretty well, contested shots at the rim and used his size well to steer opposing players towards help defense to prevent easy looks. Offensively he’s still pretty raw, but if you get him in the open floor he has deceptive bounce and will flush one on you unexpectedly. He runs the floor hard and fills the passing lanes pretty well. Once he develops his ball handling he showed flashes of being a guy who, when given an open lane, can put the ball on the floor and finish strong above the rim. His athleticism and mobility should allow for him to continue to develop as a more productive rebounder down the road. Langston Stallings – 2018 6’4” SG SYF Players – On a team that already has multiple scoring options, Stallings stood out because he stepped up and produced solidly in the points column. Whether he was finishing around the rim or making an open three, Langston already has some nice positional size. If he can begin to put it all together and be consistent, his stock could elevate. Deandre Gholston – 2018 6’5” F SYF Players – Gholston wasn’t overly productive in the game against the Wisconsin Swing, but there’s no denying how versatile he can be on both ends. From being able to score at all three levels to defending multiple positions on defense, Gholston is a glue guy right now, but if he can really develop his game he could be a productive two-way player. Mason Steffen – 2018 6’3” CG Wisconsin Swing – Steffen proved to be much more offensive minded against the SYF Players. In looking for his shot, he’s typically more consistent going to the rim or in the mid range area; however he did connect from the perimeter as well. I missed his ability to pass and create for teammates in this particular game, but it was nice to see him play aggressive and look for his shot more. Mitch Listau – 2018 6’4” WG Wisconsin Swing – Listau excels when he’s attacking off the dribble. Not only is he a capable passer on the move, but he’s a pretty good scorer off the dribble as well. His instincts are to get to the lane and draw contact, which he is good at doing. As Listau becomes a stronger finisher, his knack for drawing contact will become that much more of an asset. Collin Wanek – 2018 6’8” F Wisconsin Swing – Wanek is a player that I’ve become much more intrigued by as the association has gone on. A lot of what he does can be subtle, but it all adds up to a player who is a capable role player for the Swing. He shows flashes of some nice foot work as he looks to score from the post. He is also an underrated passer from the post. He talks on defense and competes well. Wanke is a prospect to keep an eye on as the AAU season continues. 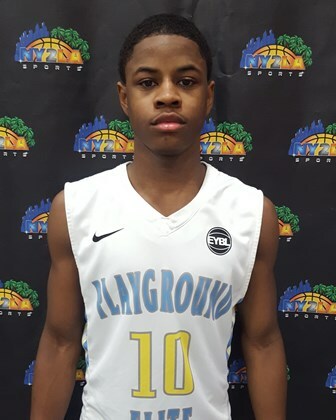 Ahmad Muhammad – 2018 6’ PG Kessel Heat Black – Muhammad is a reliable point guard. He initiates the offense and makes the simple pass consistently. He understands his role and plays within the framework of his team. Ahmad looks to drive off the bounce when he sees an opening and also finishes on the break at the rim. For all the things that make Muhammad solid, it will be interesting to see how he develops. Being more aggressive in looking to attack, adding a consistent jump shot, improving on quickness and athleticism are on the list of things he’ll want to focus on going forward. There’s certainly something within Ahmad and it’ll be interesting to see just how much of it he taps into. Isaiah Poor Bear Chandler – 2017 6’9” F/C Omaha Elite – Chandler is a big body who likes to battle on the backboards on both ends. His size and mobility allow for him to be a real factor at the front of the rim when it comes to tip-ins and put backs. He runs the floor pretty well and can be a trailing big who finishes strong above the rim. When there’s an opening inside and Chandler has the ball a dunk is on it’s way. Logan Strom – 2017 6’8” F/C Omaha Elite – Chandler’s front court counterpart, Logan Strom, is a very skilled post big. He has good foot work on the low block; complete with countermoves that make it hard for opposing bigs to keep him from scoring inside. Strom is also comfortable passing from the post in case he doesn’t have a look at the rim. He’s a pretty solid rebounder at this stage, who competes on the glass at both ends. Logan’s stock should only get better as more Division I coaches get their eyes on him. Brandon McCombs – 2017 6’7” F Illinois Irish Elite – McCombs is the Irish’s Mister Effort. When a big rebound is needed, Brandon got it. When a bucket was needed, Brandon got it. In a tough loss against the Playground Elite on Saturday, McCombs was a bright spot. While I don’t have the official stats in front of me, his impact on the glass and in the points column had to have equaled out to a double-double. If not, it sure felt like it. McCombs proved that contact isn’t something he minds as he kept battling. Nana Akenten – 2017 6’6” SF Illinois Celtics/Hoopers – Akenten has consistently been a name to pay attention to from the start of the association. In the morning session, Akenten showed he could score at all three levels and has a pretty solid jumper. He can score from the perimeter, but he also can post smaller defenders and score in the post with a turnaround. If Nana can add some separation speed or even go-to moves with his foot work or dribble that can help him create space, it will only enhance his ability to score the ball. He did show he could use a jab step effectively, which points to signs that he has the know-how to get his shot off. Teddy Allen – 2017 6’5” F OSA Crusaders – Allen prove to be a worthy counter-scorer to Nana Akenten, as Allen and OSA played against Akenten and the Illinois Celtics in the morning session. Allen can post and bully his way to the front of the rim or he can use his quick release and knock down the three ball. Like Akenten, adding more quickness will certainly help him create space at the next level. Allen likes to take his man off the dribble as more of a straight line driver. If he can improve his handle that aspect of his game could get better. Overall, there’s no denying Allen can be a tough cover at this level and he has it in him to get hot as a scorer. Christopher Knight – 6’8” PF Wisconsin Swing – Knight was very active around the rim in the Swings’ afternoon matchup against Grand Rapids Storm. He was tough to keep out of the lane and was a pretty solid finisher. While he mostly plays below the rim, he showed he could finish strong above it when there’s an opening. The Storm couldn’t keep control of him in the lane. Knight showed flashes of touch on the low block and in the lane. Over time, Knight will want to become a more consistent finisher given some of the close looks he had and missed. His length and mobility allow him to be an effective rim protector as well. Terrence Lewis – 2017 6’6” SF Playground Elite – By his own standards, Lewis had a tough shooting game against the Illinois Irish Elite. However, he had a good scoring stretch at the end of the first half that extended to the beginning of the second half that helped give the Playground Elite enough of cushion to get the win. Per his usual, during this stretch, he showed his jump shooting skills and explosive above-rim transition dunks. Alou Dillon Jr. – 2017 6’8” PF Playground Elite – Like Brandon McComb did for his Illinois Irish team, Alou Dillon Jr. did much of the same for the Playground Elite. As the Irish and Playground Elite faced off, Dillon became a focal point for rebounds and buckets. Dillon was a factor around the rim throughout the game and became more effective as the game went on. His impact is a big part as to why his team pulled out a win against a talented Illinois Irish. Bryce Irsfeld – 2017 6’1” PG Minnesota Comets Elite – Irsfeld has become a familiar name in the NY2LA Association and for good reason. It doesn’t take long to see what has college coaches offering him more frequently as the AAU progresses. His impact as a playmaker and passer are unquestionable. His willingness to give up the ball and make solid passes keeps his team going. Aside from being able to make plays, you know you can rely on Irsfeld to make the right play. While his handle and separation speed could be better, Irsfeld is a perfect example of not wasting any movement, knowing where you’re going with the ball and how to get there efficiently. Ayo Akinwole – 2017 5’11” PG Omaha Elite – Akinwole is a solid lead guard who plays with pace, makes the correct passes more often than not and he can make open shots. There’s a poise and maturity to his game that makes you feel comfortable with the ball in his hands. On defense he pressures the ball very well. Ayo uses his hands and anticipates well, both of which leads to steals and fast break opportunities. Jay Small – 2017 6’2” CG Omaha Elite – Small is a change of pace from his backcourt mate, Ayo Akinwole. Small likes to get the ball and sprint to the rim and attack. He possesses solid in and out shift in his handle that allow him to break defenders down; especially in the open floor. He can either drive strong or make open threes; either way he’s looking to put pressure on the defense. It goes without saying that small has a big motor. Aguir Agau – 2017 6’6” SF Omaha Elite – Agua is a long, wiry wing who possesses some nice athleticism. Agua handles the ball well and can get in and out of his dribble pretty quickly. He can either break a defender down and expose an open lane with a strong above-rim finish or he can shoot it off the catch or dribble. His length allows him to provide help defense and protect the rim. As long as Agua doesn’t over dribble, his handle is an asset that allows him to create space and be productive. Once he fills out, it’ll be interesting to see how much better he can be at attacking the rim. Devin Whitlow – 2017 5’9” PG Illinois Irish Elite – Whitlow made some big plays late in his team’s loss to Playground Elite. Where it was staying calm and initiating the offense or attacking and creating off the dribble, Whitlow proved to be pretty dependable down the stretch. He showed his floater, mid range game and ability to drive and find teammates with the pass. The foundation is certainly in place with the rising senior. Brandon Lawani – 2017 6’7” PF Illinois Celtics/Hoopers – Lawani possesses a chiseled frame that certainly helps him pass the eye test. In terms of production his game is still very much developing. Brandon shows flashes of a post game, but his touch isn’t quite there yet. As a rebounder he could learn to become more physical and be consistent in boxing out and carving out space. He has the mobility and athleticism to make an impact as he puts his game together. If he ca develop a jump shot and a go-to move in the post, it would certainly help his stock. There is more to Brandon’s game and only time will tell how much of it comes to fruition.